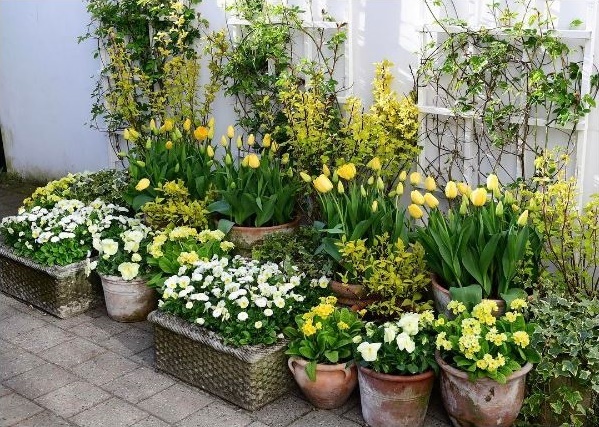 I give credit for the monoculture trend in container design to the brilliant container groupings by Danish gardener Claus Dalby. 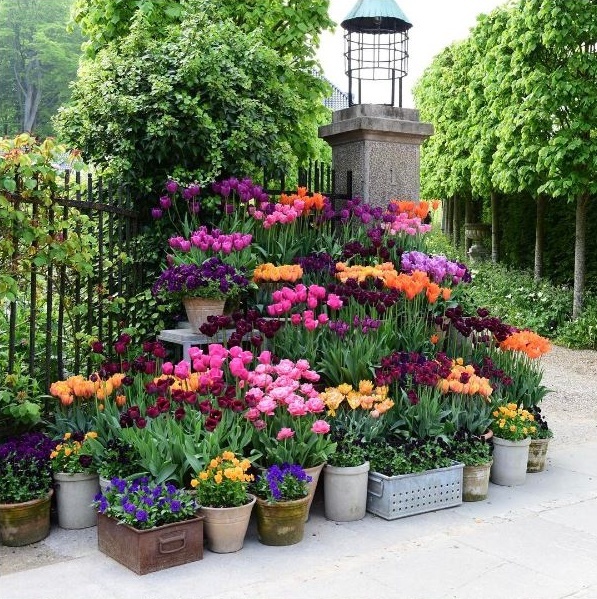 The groupings of containers he places at the entrance of his garden receive over 2,000 Instagram likes for the striking color and scale impact they create. Traditionally you see “mono” container groups of singular variety of specimen plants, such as begonias or succulents. However, this new trend focuses on a variety of plants curated based on color and texture. I compare it to a French or English florist showcasing the seasons best blooms at the entrance to their shop. The work featured here is all by Claus, but there are a lot of Nordic designers that are creating amazing monoculture container groupings are large and smaller scale. Generally, monocultures are not a good horticulture practice since they leave your garden vulnerable to pest and disease. Just ask anyone losing their boxwood to boxwood blight or dealing with the relics of Emerald Ash borer. 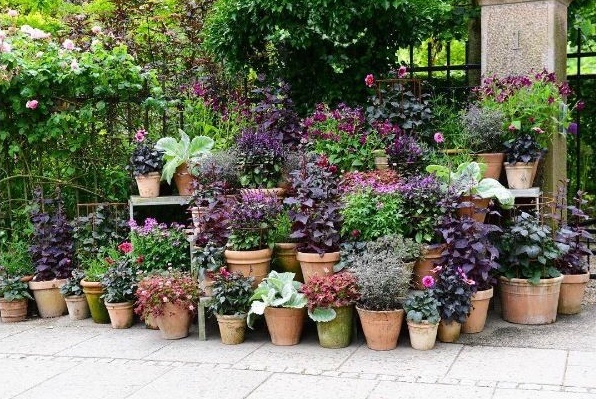 However in container gardens, planting pots in a singular species gives you flexibility in swapping out under performers and revise placement based on height and spread. SKILL LEVEL: This container design method is great for gardening novices, you can move and swap to keep it looking fresh and easily replant any unsuccessful pot. Also mono-containers can use smaller, less expensive containers and be placed in compact outdoor spaces. Plant geek level gardeners will also love this trend since you can highlight your unique plants and constantly fiddle with your groupings. PLANT SELECTION: Following in Claus’ footsteps, I recommending following a strict color palate when selecting plants. Either go for variations on one color family or just warm or cool tones. If you are more confident in color theory, mix it up with using complementary colors, etc. But remember this is a designed collection, not a hodgepodge of random plants. CONTAINER SELECTION: This design is great for smaller containers which don’t work with when building combo containers. Since using small and easily moved containers they can be made of just about any material; terracotta (just store indoors during freezing temperatures), metal, concrete, pottery, fiber-clay and reclaimed containers. CARE: Smaller containers will have more frequent maintenance. Check soil daily for moisture. Some weather could require daily watering compared to their in the ground counterparts. Smaller pots provide less organic matter for growing and will result in root bound plants with a shorter plant lifespans for your plants. Outside of watering, remember to fertilize and feed your plants. Also lighter containers could be susceptible to strong winds blowing over, so just take note if placing on a balcony. ARRANGING: For the height and impact, you need a multi-tiered surface. You can start with a grouping of tables nesting together or line a collection down your stairs. You can take it to the next level and find or build a tiered plant stand (try searching antique/vintage French and English plant stand for some ideas). The objective is to have a graduated height with focus on the plants not the stand. For the minimum I would start with 10 containers and a maximum only limited to what the space can hold. I am currently building my small container supply and designing a plant stand based on some antique French models to create my own grand display. I will share the plant stand design and planting results. Also, if you don’t already follow Claus on Instagram (with over 100,000 followers- I hope you do), I highly recommend you add him to your list and include posting notification. Outside of views into his own garden, Claus visits some beautiful gardens across Europe. This entry was posted in C O N T A I N E R S, GARDEN DESIGN, Landscape Design and tagged begonias, Claus Dalby, container design, CONTAINER GROUPING, CONTAINER SELECTION, entry way containers, garden design, garden inspiration, garden trend, gardening, landscape design, MONOCULTURE CONTAINER, Nordic, Nordic design, Norwegian designers, Plant Combos, PLANT SELECTION by Nick. Bookmark the permalink. Hi Nick — I first saw this technique used at Great Dixter. 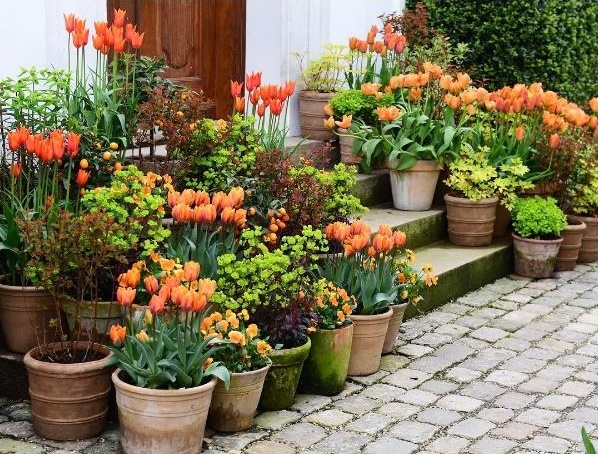 Christopher Lloyd always had a big display of individual pots flanking the grand entrance to his home. The practice continues and is always wonderful (among so many goodies there!). He used it as an opportunity to feature unusual plants as well as compose evolving combinations of texture and color. Beautiful ideas. Thanks for the IG follow link. как подобрать оправу для очков по форме лица для женщин – у ребёнка заложен нос но нет соплей как лечить, маски от пигментации на лице в домашних условиях. Beutiful ideas. I will try to copy some of them because they look beautiful. Pingback: fashionplants | Do you Have Krukker?